Tomorrow, the largest format article I’ve ever had my design work printed on to will be hung outside one of my city’s loveliest buildings. Lubaina Himid’s Meticulous Observations and Naming the Money exhibition is on now at Liverpool’s Walker Art Gallery until 18 March 2018 and my hard to miss hangings, inside and out will welcome people into the building. As the graphic designer for this exhibition, my role was to use the artist’s work in creative ways across a wide range of media, from leaflets and posters to advertising and the massive banner that will be hung between two of the huge Corinthian pillars at the front of the gallery. Lubaina’s colourful images were a joy to work with and I sampled the key hues from the works to create the show’s corporate logotype. Her works tell an interesting story and are unusually plotted throughout the esteemed building in various locations. The full installation Naming the Money was originally gifted by the artist to the International Slavery Museum and addresses how Europe’s wealthy classes spent their money and flaunted their power in the 18th and 19th centuries using enslaved African men and women. The figures, each with their own profession and life-story, demonstrate how enslavement was disguised and glamorised. As well as her own work, Lubaina has also selected works to display by other women artists, and these occupy one room within the gallery. At the centre of this display is her 1987 series of watercolour drawings, ‘Scenes from the life of Toussaint L’Overture’, about the former slave who led the Haitian revolution. 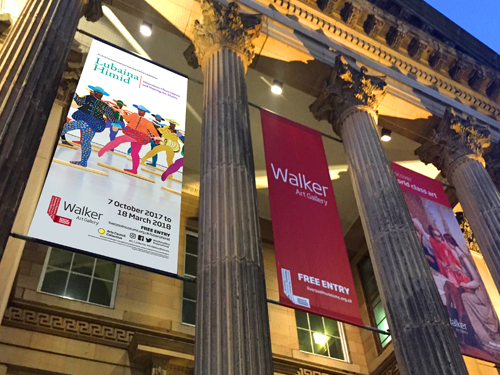 I have visited the Walker Art Gallery for as long as I can remember, it is a place I cherish. For such a foreboding and austere building, full of wonderful art treasures dating back hundreds of years, it always manages to feel welcoming. It houses one of the largest art collections in England, outside London. It is promoted as “the National Gallery of the North” because it is not a local or regional gallery but is part of the national museums and galleries administered directly from central Government funds. It does a great job of mixing up traditional fine art and sculpture with more contemporary works and Lubaina Himid’s art is another good example of this. I’ve always felt that this is a gallery that dares to be different and this is also demonstrated every couple of years when it hosts the wonderfully eclectic John Moores Painting Prize, something it has done since 1957 and is an art highlight for me. I’ve entered pieces myself a couple of times, but the less said about that the better – if you’re interested, there’s a blog entry about one of my failed entries HERE.